North Georgia residents have the knowledge, drive and innovative spirit to rival any urban area, yet they are continually underserved by major telecommunications companies. Ignored due to geographical isolation and sparse populations, North Georgia communities have fewer connectivity options. These citizens often pay more than urban residents for slower, less reliable Internet service. NGN’s fiber optic network is changing that. Affordable, fast broadband service provides solutions to these daily struggles by connecting North Georgia to the global marketplace. Gigabit-speed connectivity is already changing education in North Georgia. Through the Education Exchange program, NGN is empowering schools to use the network to share resources, expand learning opportunities and improve communications. Geographical isolation should never keep a patient from receiving quality medical treatment. Telemedicine connects big-city medical resources to anywhere in the world, including North Georgia. Fiber networks are not only fast but also incredibly secure. 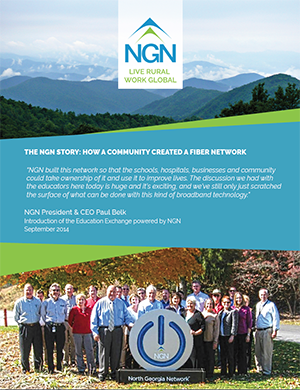 Local governments connected to fiber have the opportunity to innovate in ways that make a difference in the daily lives of North Georgians. Area businesses require advanced technology to compete in the global economy. NGN can support even the most bandwidth-hungry e-commerce applications. Fiber networks allow businesses to easily connect to customers down the road, across the country and around the world. Fiber connectivity makes our region more attractive to both businesses and employees. A fiber-connected rural Georgia creates jobs for employees who want to “work fast but live slow”. Technology cannot be held hostage. Through NGN, other ISPs can connect to the 1,600-mile network and extend super-fast Internet service to their customers’ homes.